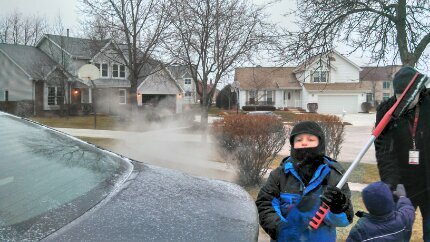 Jake helped scrape Hubz’s windows. 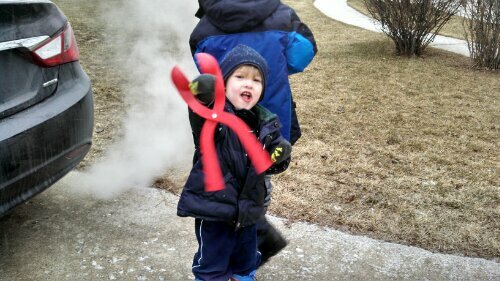 Cole is hopeful that we’ll get enough snow to finally use the snowball-maker. 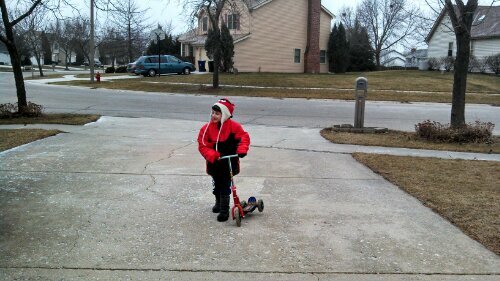 Tate is still scootering around–just all bundled up and in boots. I say it’s some good OT. 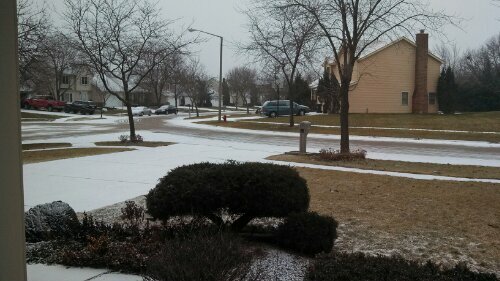 You know it’s been a snow drought when your 3 year old is excited about the driveway being slightly covered. It just looks cold. Brrr! Time for another cup of coffee!!! The weather around here has been all over the place lately. On Friday and Saturday it was warm enough that I could allow my children to go outside with only one of the layers of their 2-layer coats, and a hat. They really didn’t even need their mittens or gloves. No boots. No snowpants. High 40-degree weather in January is a god-send, and we enjoyed it. I made the boys go outside and play on Saturday. I know, I’m the meanest mom EVER! Well, according to Jake, anyway. Tate and Cole were all over running around, playing tag, and swinging on the swingset. They took in all of the glory that is playing outdoors. I knew I could allow them to go outside and frolic because come Sunday, the weather was going to turn. Turn frigid. Turn into the weather that is notorious around these parts. So we played and ran around. When the boys woke us up on Sunday morning, at 4 am, Tate was already whining and scripting. He had dark half circles under his eyes, and his ears were bright red. He was pale and looked restless. Hubz took them downstairs and I tried to sleep a bit longer. Cole had jumped into bed with me, so I had sharp little toes in my back and spleen…but we managed to stay in bed until close to 7. Tate wore his pajamas all day. He didn’t want to leave the house. He didn’t want to eat much, either. Later in the day, after a snack of Starburst, Tate felt ill and threw up. Once. But he was all out of sorts. By the time I got back from a baby shower that I had attended, he was in full-blown whine mode. He was seeking input from his brothers, the couch, the floor, from me, from Hubz. He wanted to walk on the treadmill, too. It was rough. Yesterday our temperatures hovered around 8 degrees Fahrenheit. Brr! It was frigid. It was windy. Sunny, thankfully, but cold. I was able to talk Tate into wearing clothes, but he just wanted to lay on the couch. He was zonked. He had woken up at 3 am. He dozed off for a bit after that, but was up by 5:30 a.m. for good. He was a zombie. I was, too. Because he was so dysregulated from the weather and lack of sleep, he did a circuit of OT in our house. He did the treadmill at a 2.5 incline and 3.5 speed for about 10 minutes. Then he rode our exercise bike. Once he tired of that, he moved to our trampoline. That lasted for a mere minute and he sat on the exercise ball. Eventually he vacuumed for about 15 minutes…scripting the entire time. I would try to engage him, but he would simply return to his scripts. It made me sad…and frustrated…and worried. I know I felt awful and worn down. I just wanted to sleep. Tate would have none of it. Thankfully, Hubz was home yesterday due to MLK Jr. Day. I could get a nap in before going to teach my religious ed class. Tate was up the entire 1 3/4 hours that I slept. He was up the entire time we were away. And he whined the whole time. I could see how frayed Hubz’s nerves were when we got back. Luckily, Tate was ok through dinner. Hubz took the boys upstairs to shower and bathe. Usually, a good soak in the tub is soothing and relaxes Tate. Not last night. His anxiety was high. He was in a state of total dysregulation. He whined for the next half hour. And then, we put him to bed. After a brief fight, he did succumb to sleep…and slept until about 5 am, which is a decent sleep, considering we put him to bed at 7:15. The next few days are going to be bone-chilling cold…but it will gradually warm up. By next Monday we’re supposed to be near 40 degrees again. These big swings in temperatures drive anyone crazy, but most especially my child with sensory processing disorder. He just can’t keep up. Now, I’m off to bundle up from my head to my toes so I can go get Tate from school…I need about 15 minutes to just get myself bundled up…let alone anyone else!!! This is my car. This is my car covered with about an inch of snow. This is my car covered in about an inch of snow while I’ve sat in the therapy office waiting for Tate. We have another hour left. The admin here had the news radio station blaring, and I heard that a commute which should take about 40 minutes is taking 2 hours and 40 minutes… Ah, what I do for my kid…. Snow, in and of itself, doesn’t bother me. 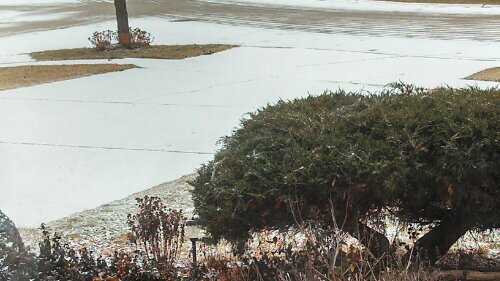 It is pretty when it comes down and lies freshly fallen. It is a unique quiet as it blankets the earth. What I don’t like about snow is the condition of the roads, the driving in it, and the morons who think that they are allowed to drive fast and crazy because they have 4-wheel-drive. I would much rather be at home, snuggled in a blanket and a cup of Hot Chai in my hand. But, no. Tate came to therapy today. One, it keeps him in his routine, for which we pay greatly for breaking. Two, he does so much better when he has consistency. Three, he has had a rough week, and he needs it. Winter. It’s for the birds…or, well, penguins, really. Or the walruses. Or the polar bears. Or the narwhals. Definitely not for me.